Ever since Nisha introduced me to OPOS I have been an ardent follower. I am not the kind that swoons over fancy dishes and cooking is just an essential skill – the sooner am done making what I want the better it is. The kitchen is not my refuge nor is cooking a passion. I still prefer home cooked food to restaurant food because am ultra finicky about hygiene, taste and of course nutrition. OPOS was made for people like me !! I tried many of the recipes from the old manual, then followed all the posts on the OPOS school Facebook group, and now for the past year plus food is OPOSed at home everyday. I cannot cook in any other way. Amma uses all the OPOS staples – tamarind paste, ginger garlic paste, cooked dal, VLM veggies … but she continues to call OPOS as “BOFORS” and says its too quick for her liking. 🙂 But she loves everything I make and every time I think of restaurant food she reminds me of some OPOS specials and says “make the ishtu or the Biriyani or semiya upma”. I don’t remember making so many kinds of vegetables and different cuisines as I do now and its all thanks to OPOS. If it cannot be OPOSed, my mother will make it, I won’t. The only non-OPOSed thing that I eat is dosa and idli for now. The idli stand that I have doesn’t fit into any of the smaller cookers that I have. So it is still being steamed the traditional way. And yes the “more kozhambu” made by Amma is still the best … I won’t OPOS it anytime soon. First the OPOS cookbook came out and I had a mini contribution in the cover as I suggested the picture of the three pieces of beans (raw, OPOSed, steamed). I was so thrilled. Bought the book immediately on Kindle. Do buy it if you haven’t already. Then I saw RK developing the OPOS Magic Pot in collaboration with the manufacturers of pressure cookers with the brand name “Butterfly”. 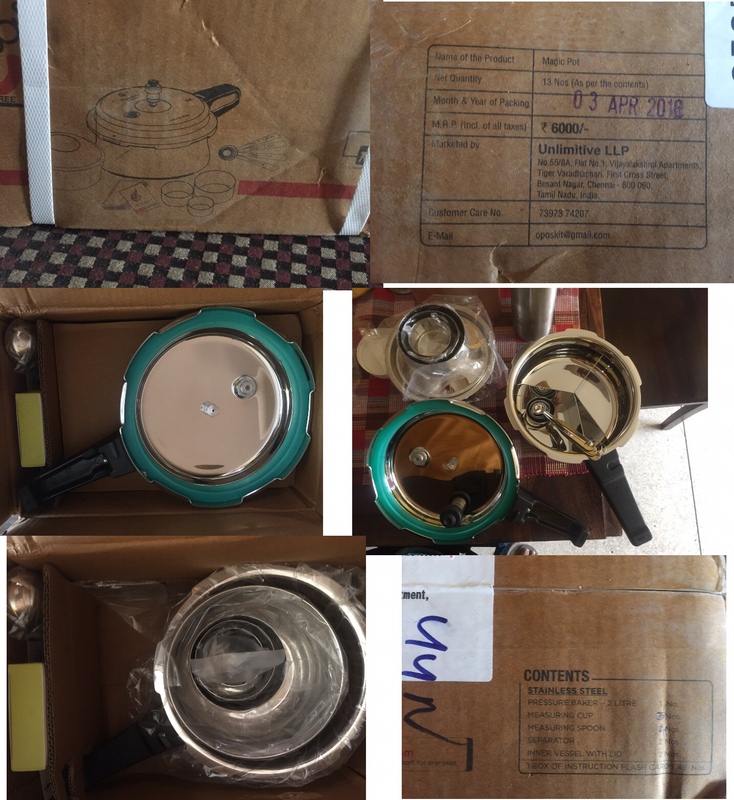 This was not just a superior pressure cooker, it was a whole OPOS kit in steel. I obviously wanted one. I missed the first bus … the 1000 kits just flew off the shelves like Harry Potter on the broomstick ! I kept checking the https://oposkit.com website. Finally I managed to buy a couple of kits using my special discount coupon on the 18th of April. Today the kits arrived and I am like a little kid in a toyshop. Everything about the OPOS kit is awesome. As I mentioned on the chat – RK, Congratulations on creating a truly innovative product. While OPOS is awesome, the kit makes it “awesomer” because its not just a far superior pressure cooker to anything we may get in the stores, the measuring cups, the recipe cards, the separators, the tiny pot for all the PIP recipes – except for an induction stove and the raw material for cooking, one needs nothing else to cook a feast ! Btw – The second lot of the OPOS kits are also all sold out ! Disclaimer – Please join the OPOS support group on Facebook and read all the instructions before using your Pressure Cooker at home. One Pot One Shot (OPOS) is a method of cooking thats patented by Ramakrishnan. Food prepared in a pressure cooker is not automatically OPOSed :). Learn the techniques and everyone is welcome to the magical world of OPOS.